MemManage - detects memory access violations to regions that are defined in the Memory Management Unit (MPU); for example code execution from a memory region with read/write access only. BusFault - detects memory access errors on instruction fetch, data read/write, interrupt vector fetch, and register stacking (save/restore) on interrupt (entry/exit). UsageFault - detects execution of undefined instructions, unaligned memory access for load/store multiple. When enabled, divide-by-zero and other unaligned memory accesses are detected. HardFault - is the default exception and can be triggered because of an error during exception processing, or because an exception cannot be managed by any other exception mechanism. DebugFault - present only when debug was halted. Auxiliary BusFault - (Cortex-M7 only) shows additional information on BusFaults. Shows the MemManage Fault Address (MMFAR) and Status Register (MMFSR) settings. The MemManage fault status register (MMFSR) indicates a memory access violation detected by the Memory Protection Unit (MPU). Privileged access permitted only. Unprivileged accesses generate a BusFault. SCB->MMFAR Shows the content of the MemManage Fault Address Register (in HEX) located at memory address 0xE000ED34. The reset value is unknown. The MMFAR contains the address of the location that generated a MemManage fault. This address is valid only when MMARVALID is set to 1. (MMFSR) Shows the important bits of the CFSR register that identify the MemManage Fault Status Register (MMFSR). Below fields define the meaningful bits of the MMFSR. 0 (unchecked) = no instruction access violation fault. Branch to regions that are not defined in the MPU or defined as non-executable. Invalid return due to corrupted stack content. Incorrect entry in the exception vector table. 0 (unchecked) = no data access violation fault. 1 (checked) = the processor attempted a load or store at a location that does not permit the operation. The PC value stacked for the exception return points to the faulting instruction. The processor has loaded the SCB->MMFAR with the address of the attempted access. 0 (unchecked) = value in SCB->MMFAR is not a valid fault address. 1 (checked) = SCB->MMFAR holds a valid fault address. If a MemManage fault occurs and is escalated to a HardFault because of priority, the HardFault handler must set this bit to 0. This prevents problems on return to a stacked active MemManage fault handler whose SCB->MMFAR value has been overwritten. 0 (unchecked) = no unstacking fault. MPU region for the stack changed during execution of the exception handler. 0 (unchecked) = no stacking fault. Stack pointer is corrupted or not initialized. Stack is reaching a region not defined by the MPU as read/write memory. Shows the BusFault Address (BFAR) and BusFault Status Register (BFSR) settings. 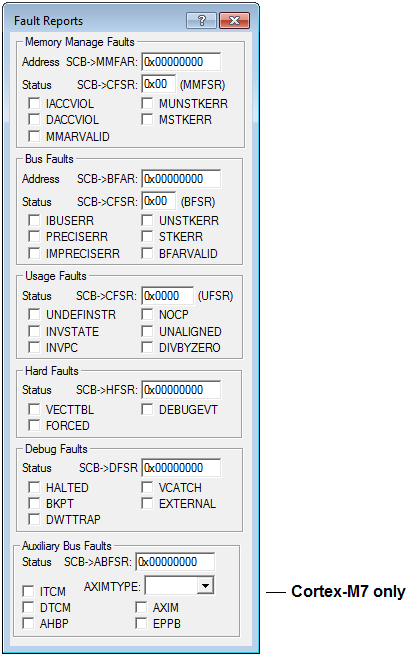 The BusFault Status Register (BFSR), located at memory address 0xE000ED29 shows the status of bus errors resulting from instruction fetches and data accesses and indicates memory access faults detected during a bus operation. Privileged access permitted only. Unprivileged accesses generate a BusFault. SCB->BFAR The BusFault Address Register (BFAR), located at memory address 0xE000ED38, contains the address (in Hex) of the location that generated a precise data access BusFault. This address is valid only when BFARVALID is set to 1. (BFSR) Shows the important bits of the CFSR register that identify the BusFault Status Register (BFSR). Below fields define the meaningful bits of the BFSR. IBUSERR Instruction bus error. Records whether a BusFault on an instruction prefetch has occurred. 0 (unchecked) = no instruction bus error. Branch to invalid memory regions for example caused by incorrect function pointers. Invalid return due to corrupted stack pointer or stack content. 0 (unchecked) = no precise data bus error. 1 (checked) = a data bus error has occurred, and the PC value stacked for the exception return points to the instruction that caused the fault. When the processor sets this bit, it writes the faulting address to SCB->BFAR. 1 (checked) = a data bus error has occurred, but the return address in the stack frame is not related to the instruction that caused the error. When the processor sets this bit, it does not write a fault address to SCB->BFAR. This is an asynchronous fault. 1 (checked) = unstack for an exception return has caused one or more BusFaults. This fault is chained to the handler. This means that when the processor sets this bit, the original return stack is still present. The processor does not adjust the SP from the failing return, does not performed a new save, and does not write a fault address to SCB->BFAR. Stack is reaching an undefined memory region. 0 (unchecked) = value in BFAR is not a valid fault address 1 (checked) = BFAR holds a valid fault address. The processor sets this bit after a BusFault where the address is known. Other faults can set this bit to 0, such as a MemManage fault occurring later. If a BusFault occurs and is escalated to a HardFault because of priority, the HardFault handler must set this bit to 0. The UsageFault Status Register (UFSR) contains the status for some instruction execution faults, and for data access. Privileged access permitted only. Unprivileged accesses generate a BusFault. (UFSR) Shows the content of the UFSR register (in HEX) located at memory address 0xE000ED2A. Reset value is 0x00000000. 0 (unchecked) = no undefined instruction. Use of instructions not supported in the Cortex-M device. Bad or corrupted memory contents. 0 (unchecked) = no invalid state. Loading a branch target address to PC with LSB=0. Stacked PSR corrupted during exception or interrupt handling. Vector table contains a vector address with LSB=0. 0 (unchecked) = no invalid PC load. Invalid return due to corrupted stack pointer, link register (LR), or stack content. ICI/IT bit in PSR invalid for an instruction. 0 (unchecked) = no UsageFault caused by attempting to access a coprocessor. 1 (checked) = attempt to access a coprocessor that does not exist. 0 (unchecked) = no unaligned access fault, or unaligned access trapping not enabled. 1 (checked) = unaligned memory access. Enable trapping of unaligned accesses by setting the UNALIGN_TRP bit in the SCB->CCR. Unaligned LDM, STM, LDRD, and STRD instructions always fault irrespective of the setting of the UNALIGN_TRP bit. DIVBYZERO Divide by zero UsageFault. 0 (unchecked) = no divide by zero fault, or divide by zero trapping not enabled. 1 (checked) = execution of an SDIV or UDIV instruction with a divisor of 0. When the processor sets this bit to 1, the PC value stacked for the exception return points to the instruction that performed the divide by zero. Enable trapping of divide by zero by setting the DIV_0_TRP bit in the SCB->CCR to 1. Shows the settings of the HardFault Status Register (HFSR). Privileged access permitted only. Unprivileged accesses generate a BusFault. SCB->HFSR Shows the content of the HFSR register (in HEX) located at memory address 0xE000ED2C. Reset value is 0x00000000. This register is read, write to clear. This means, bits in the register read normally, but writing 1 to any bit clears that bit to 0. 0 (unchecked) = no vector table read. 1 (checked) = on vector table read. When this bit is set, the PC value stacked for the exception return points to the instruction that was preempted by the exception. This error is always a HardFault. FORCED Indicates a forced HardFault generated by escalation of a fault with configurable priority that cannot be handled, either because of priority or because it is disabled. 0 (unchecked) = no forced HardFault. 1 (checked) = forced and escalated HardFault. When this bit is set, the HardFault handler must read the other fault status registers to find the cause of the fault. DWTRAP The Data Watchpoint (DW) flag stops the processor at the current instruction or at the next instruction. 0 (unchecked) = no DW match. 1 (checked) = DW match. DEBUGEVT Indicates when a debug event has occurred. When writing to the register, you must write 0 to this bit, otherwise the behavior is unpredictable. 0 (unchecked) = no debug event occurred. 1 (checked) = debug event occurred, DFSR has been updated. Shows the Debug Fault Status Register (DFSR) settings. SCB->DFSR Shows the content of the DFSR register (in HEX) located at memory address 0xE000ED30. Reset value is 0x00000000. The register is sticky read/write clear. This means, it can be read normally. Writing a 1 to a bit clears that bit. 0 (unchecked) = no halt request. 1 (checked) = halt requested by DAP or halted with a debugging step command. BKPT The BKPT flag is set by the execution of the BKPT instruction or on an instruction whose address triggered the breakpoint comparator match. When the processor has halted, the return PC points to the address of the breakpointed instruction. 0 (unchecked) = no BKPT instruction or hardware breakpoint match. 1 (checked) = BKPT instruction or hardware breakpoint match. VCATCH When the VCATCH flag is set, a flag in the Debug Exception and Monitor Control Register is also set to indicate the type of vector catch. 0 (unchecked) = no vector catch occurred. 1 (checked) = vector catch occurred. EXTERNAL When the External debug request flag is set, then the processor stops on next instruction boundary. 0 (unchecked) = no EDBGRQ has occurred. 1 (checked) = EDBGRQ has halted the core. Shows the optional Auxiliary BusFault Status Register (ABFSR) settings (Cortex-M7 only). SCB->AFSR Shows the content of the ABFSR register (in HEX) located at memory address 0xE000EFA8. Reset value is 0x00000000. The ABFSR stores information on the source of asynchronous BusFaults. If a BusFault has occurred, the fault handler can read this register to determine which bus interface triggered the fault, and if the source is the AXIM interface, which error type is received. The ABFSR[4:0] fields remains valid until cleared by writing to the ABFSR with any value. The interfaces might not be present on your implementation. AXIMTYPE Indicates the type of fault on the AXIM interface. The values are valid only when AXIM = 1. ITCM Asynchronous fault on ITCM interface. DTCM Asynchronous fault on DTCM interface. AHBP Asynchronous fault on AHBP interface. AXIM Asynchronous fault on AXIM interface. EPPB Asynchronous fault on EPPB interface.